A demonstrator of the Uran-9 unmanned ground combat vehicle seen during Army-2016 International Miltary-Technical Forum. Image courtesy of Vitaly V. Kuzmin. 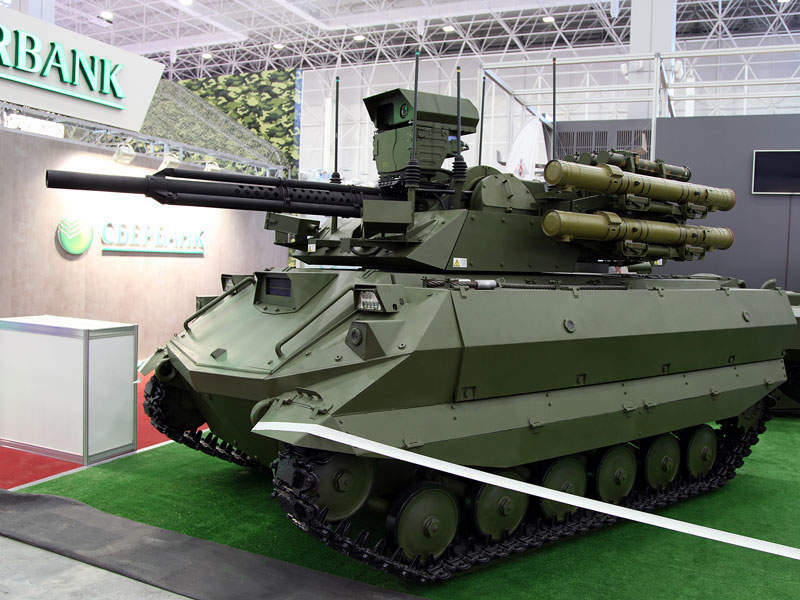 The Uran-9 combat robot can be armed with up to 9M120-1 Ataka anti-tank guided missile launchers. Image courtesy of Mike1979 Russia. 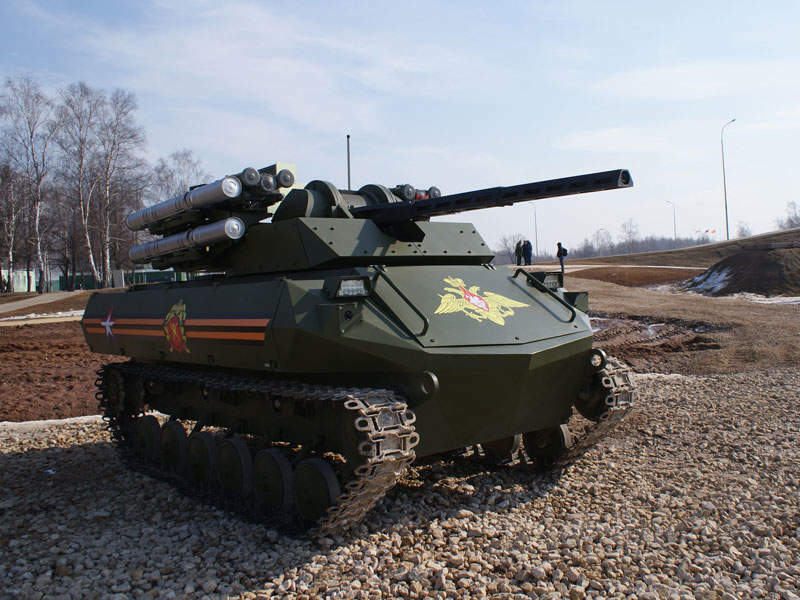 The Uran-9 unmanned ground vehicle has a maximum road speed of 35km/h. Image courtesy of ROSOBORONEXPORT. The Uran-9 robot is being developed by JSC 766 UPTK. Image courtesy of ROSOBORONEXPORT. The Uran-9 multipurpose unmanned ground combat vehicle was unveiled by Russian military equipment manufacturer JSC 766 UPTK during the Army-2016 International Miltary-Technical Forum held in Russia in September 2016. The vehicle is designed to provide remote reconnaissance and fire support to a variety of tasks conducted by the counter-terrorism, reconnaissance and military units in urban environments. Fitted with a variety of weapons and sensors, the robot will improve the combat effectiveness of the infantry squads, while offering maximum protection to the personnel. In December 2015, Rostec Corporation subsidiary Rosoboronexport announced that the company will start promoting the Uran-9 combat robot to the international markets in 2016. The Uran-9 robot complex consists of four unmanned ground vehicles, one mobile command station, and a tractor for transportation of robots. The combat vehicle is based on tracked chassis equipped with six road wheels, an idler and a drive sprocket. It is 5.12m-long, 2.53m-wide and 2.5m-high, and has a kerb weight of approximately 10,000kg. The Uran-9 robotic system is fitted with a remotely operated turret for mounting different light and medium-calibre weapons and missiles, based on mission needs. The weapon system has four 9M120-1 Ataka anti-tank guided missile launchers, two on each side, to defeat the enemy main battle tanks and armoured targets. 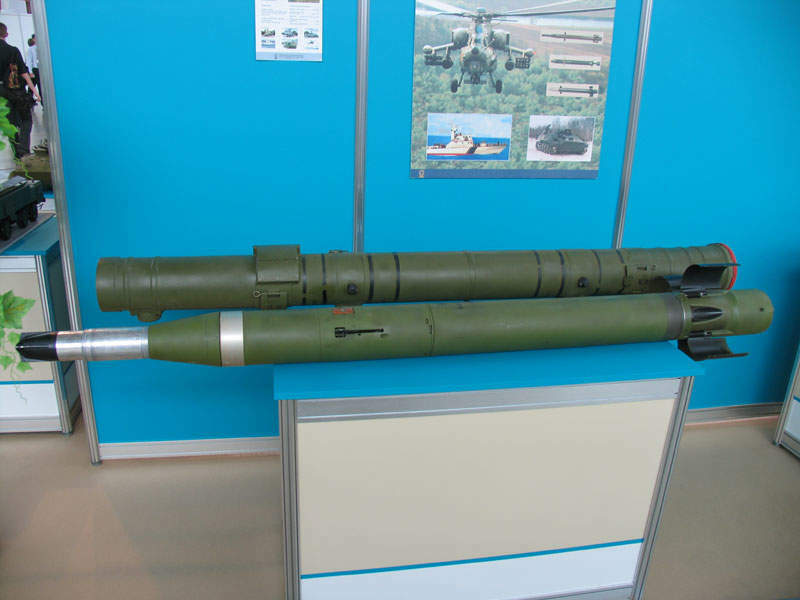 The 9M120-1 Ataka missile offers a firing range of 0.4km to 6km, and is capable of penetrating armour to a depth of 800mm behind explosive reactive armour (ERA). The turret also incorporates one stabilised 30mm 2A72 automatic cannon for defence against ground and low-flying aerial targets, as well as one Kalashnikov PKT/PKTM 7.62mm coaxial machine gun to engage ground-based light armoured targets. The robot is also provided with six 93mm-calibre rocket-propelled Shmel-M reactive flamethrowers, three on each side of the turret. With a maximum firing range of 1km, the Shmel-M can destroy enemy manpower and weaponry inside protective shelters and field fortifications. 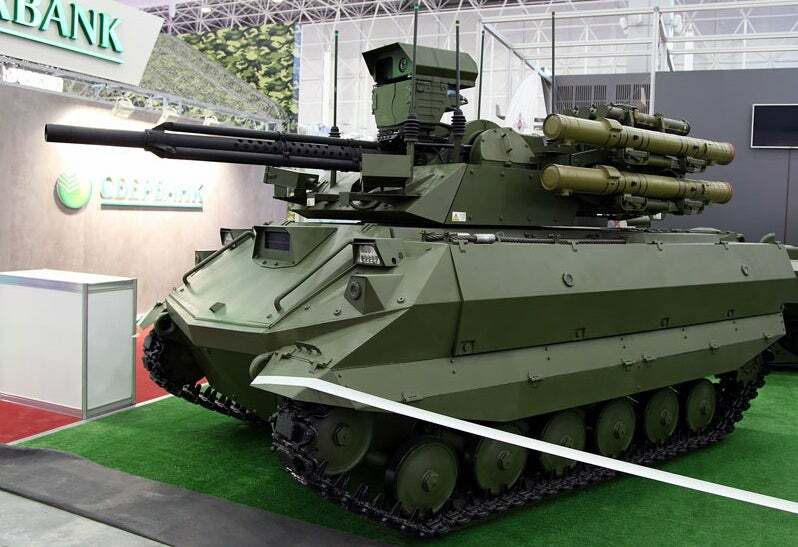 Weapon options for the Uran-9 vehicle include four Igla surface-to-air missiles, 9K333 Verba man-portable air defence systems, and up to six 9M133M Kornet-M anti-tank guided missiles. 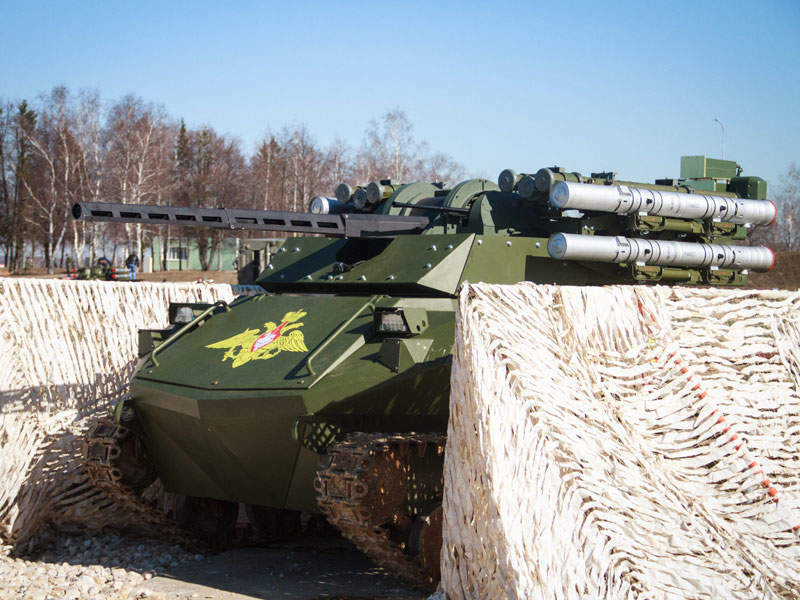 The Uran-9 unmanned ground combat vehicle has the ability to resist firing of small arms ammunition and shell splinters. The steel armour plates of the hull offer protection for the vehicle suspension. The robotic system is equipped with a wide range of remote-controlled sensor modules such as laser warning system, and electro-optic and thermal imaging cameras. The onboard fire control system consists of automatic target detection, identification and tracking devices, as well as a ballistic computer. It is capable of detecting and tracking enemy targets travelling at a distance of 6km during the day and at 3km at night. The Uran-9 robot can be operated in either autonomous or manual mode. In autonomous mode, the vehicle can automatically identify, detect, track and defend enemy targets based on the pre-programmed path set by the operator. The vehicle uses detour path finding for obstacle avoidance in the autonomous mode. The Uran-9 robot is manually controlled by a single operator from a mobile command and control station mounted on a 6×6 tactical truck from a safe distance of 3km. It can also be controlled by means of a portable control panel, in the manual mode. In addition, the vehicles are capable of moving autonomously in a column. Power for the robot comes from a diesel-electric power plant, which provides a maximum speed of 35km/h on highways. The Uran-9 can travel at a maximum cross-country speed of 25km/h and can attain a maximum speed of 10km/h on off-road conditions. The robot’s tracked chassis offers increased cross-country mobility. The average specific ground pressure is 0.6kg/sq.